The in basket: A couple of questions arose in my mind as I went to Seattle and returned via the Fauntleroy ferry terminal one September Saturday. As I left the dock on my way to a play in Seattle, I found a ferry employee directing traffic, stopping traffic passing by so departing vehicles didn’t have to stop before pulling out. Then on my return trip, I watched as the off-loading began on the boat that had just arrived and that I was waiting to catch. As always, motorcycles were the first to be released. I’d guess there were about a dozen. I could only estimate from my vantage point two lanes over, but my estimate is that each and every one was traveling 40 miles per hour or faster. They were traveling much faster than any of the cars that followed them. 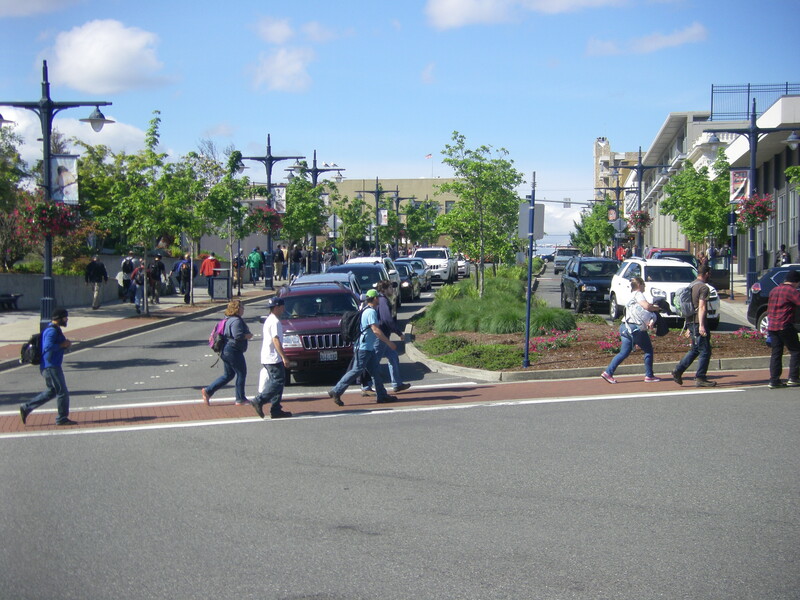 The last I’d heard about traffic control at the dock’s outlet onto Fauntleroy Way, from a reader who wondered a couple of years ago if a traffic signal might be installed there, was that there was none. I asked when it resumed. And I asked if there is a speed limit on ferry docks that would support a traffic citation. State Trooper Russ Winger, who speaks for the State Patrol here, including the Vessel and Terminal (VATS) units, says, “VATS assigned troopers, like any trooper, can enforce any speed limit, however they are usually out of the patrol car, patrolling the terminal or providing security on vessels and not in any position to check a vehicles speed with radar or Lidar. 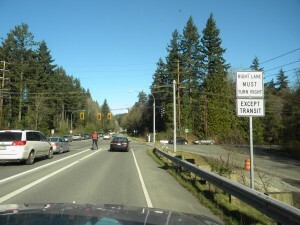 “Traffic control at Fauntleroy started on July 27,” Hadley said. “During the fall/winter seasons the hours are: Monday-Friday, 6 a.m. to 10 a.m. & 1 p.m. to 7 p.m.” Evidently, Saturdays have some, too, as Sept. 26 is when I was there. at the corner of 1st and Pacific (at the shipyard gate) for when the workers are leaving. It is pretty much impossible to get a car through there as the workers won’t stop at all and it’s basically a constant stream of pedestrian traffic. “I am getting dropped off at 4pm for the 4:20pm ferry to Seattle and it’s a real problem,” she said. The out basket: I watched this spot from 3:40 to 4:20 one Thursday this month and the situation she describes certainly raised the anxiety level for drivers trying to get to the ferry around 4 p.m. But while it’s always risky to use one day’s observation to generalize about a traffic situation, what I saw didn’t justify paying for a pedestrian light, by which I assume Elissa means a walk-don’t walk light with the requisite overhead signal heads to stop cars during the walk cycle. It would have the advantage of letting drivers know they WILL get an opportunity to get to the toll booths before the ferry leaves. I saw one driver pull out of line and around the car stopped at the crosswalk in frustration when the line of vehicles extended back to Burwell. Some drivers seemed to be applying crosswalk law that says you have to have a lane of travel between you and the pedestrian before you can proceed, a practical impossibility at that hour. Nonetheless, the flow of pedestrians had all but stopped by 4:15. no cars were backed up at either the crosswalk or the toll booths then and the only drivers uncertain of getting on the boat were the late arrivals you see at any ferry departure. Traffic signals are expensive and the city is struggling to stretch its street dollars as it is. Since I assume Elissa’s ride is in the single lane that continues around without going to the toll booths, I would think her solution would be to get out at the crosswalk and walk from there. It’s not much farther from there to the ferry terminal than designated passenger drop-off locations. The in basket: Kelli Lambert says in an e-mail, “I am wondering about the routing of bike traffic when the bikes off-load from the ferry (in Bremerton). I drop my husband off around 7 a.m. for the 7:20 ferry, and quite often the stream of bikes (which my husband and I refer to as the ‘Tour de France’) comes riding past me very close on the driver’s side, against the one-way traffic. “The other day they all started whizzing across First Street and a Kitsap Transit bus came awfully close to hitting one. It’s dark and congested at that time of day. “I assume many of the bicyclists are going to the shipyard for work. What is the actual route they are supposed to take? And does the Bremerton Police enforce it at all?” she asked. The out basket: I get many complaints of this kind, bicyclists using their smaller size and mobility to do things cars aren’t physically able to, whether it’s legal or not. Oddly, these bikers can get away with what they are doing if they stay out of the roadway, use the sidewalk and don’t endanger any pedestrians while so doing. Permission to ride on sidewalks, cautiously, is the main exception to the rule Pete states about bicyclist’s having to obey the rules of the road. Otherwise, they should do what cars do, go around the block to get to the shipyard in the traffic lanes. The in basket: Erik Bjarnson writes, “I take the Kingston-Edmonds ferry about half a dozen times per month. When returning from Edmonds I get stopped at a red light at Washington Boulevard NE (the first light coming off the ferry) about 80 percent of the time. I don’t mind stopping at red lights when there is a reason for the light to be red, but it I have never stopped at that light and seen any cross traffic, vehicular or pedestrian. Are you aware of any reason this light goes red to stop ferry traffic? Is it timed to give breaks in ferry traffic? Is it timed to improve flow with other lights through Kingston? The out basket: Eric’s first guess is correct. Ken Burt of the state’s Olympic Region signal shop says the idea is to give traffic elsewhere in Kingston the opportunity to move during ferry off-loads. “The condition that is described by Mr. Blair was put in prior to October 1994,” Ken said. “The side street was recalled to allow gaps in traffic downstream from the Washington Boulevard intersection.” (Recalled is the term signal techs use to describe having the signal change.) The gaps in traffic would allow cross street movements in downtown Kingston. The in basket: A couple of readers have asked about possible changes in arrival times on the Bremerton-Seattle ferry run and off-loading practices at Colman Dock on the Seattle end. Rob Woutat took note of the conflict between ferry traffic and shift-change commuter traffic out of Naval Base Bremerton. 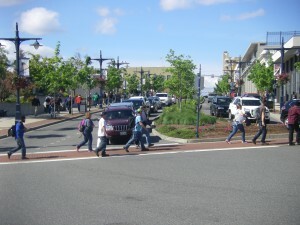 It is cited by the city as a drawback to its plans to shrink Washington Avenue to two lanes between Sixth Street and the Manette Bridge, albeit a brief one. And Yvonne Dean said, “When the ferry unloads at Seattle using the usual way of off loading – two lines of traffic at once – there becomes a large back-up caused by the lines needing to merge into one lane before getting onto Alaskan Way. There is a red light at the end of the dock with a sign saying ‘no right turn on a red light.’ It seems to me to be an extremely long light when there is no traffic coming from the left. “Why don’t they just let one lane off at a time so there is no need to merge? Why isn’t there someone at the end of the dock that can control the traffic without waiting for the light to change? Why don’t they adjust the time of the arrival of the Bremerton Ferry so that instead of using only that exit at least the people who want to go left off the dock go around the Bainbridge Island side of the dock? The out basket: I told Ron that the many years I covered the ferries before retiring as a reporter told me that seemingly minor shifts in the schedule have repercussions at other terminals on the route, plus possible crew scheduling issues. The competition with Bainbridge for how arrivals are handled on the Seattle end has impacts on when Bremerton ferries can best come and go, as the response I got from WSF public relations chief Marta Coursey suggests. Just this Tuesday, in fact, a change in the signal operation at the Yesler exit added quite a bit of green time for departing Bremerton ferry traffic, said Leonard Smith, terminal manager. “Operations at Colman Dock are extremely complicated and many factors contribute to vessel arrival times,” Marta also said. “While we do our best not to have both the Bremerton and Bainbridge Island sailings arrive at the same time, there are times when even the slightest delay in the schedule causes two boats to arrive at once. “The sailing schedule is developed to balance the needs of customers, crew staffing windows and general operations with available funding and resources. Marta didn’t address the idea of a single lane coming off the ferry from Bremerton, but I would think it would be more likely to slow the off-loading than speed it up. That, in turn, affects departure times and the ability of the boats to stay on schedule. And I imagine that if it were done, there’d be a lot of questions from ferry users about why they don’t use both lanes of the car ramp. As for how long this will be going on, Leonard said work on the seawall which now requires the merge of off-loading Bremerton traffic will end in October and that exit will return to two lanes. But complete replacement of Colman Dock will begin in 2016, beginning five years of what I’m sure will be complicated off-loadings for all dock users. The in basket: Michael Drouin writes, “Any idea when (the state) plans to replace the Edmonds ferry terminal? “The legislature is funding WSDOT to replace Colman Dock, Shouldn’t Edmonds come before?” he asked. The out basket: Michael doesn’t say why he thinks that, but plans to relocate the Edmonds terminal have been scratched. “There is no funding currently to replace the terminal,” says Susan Harris-Huether of the state ferries public affairs staff, “and we are no longer pursuing Edmonds Crossing, which (would have) relocated the ferry terminal to the Unocal / Chevron property, because of costs. “Washington State replaced the terminal building at Edmonds in 1999. We are not slated to replace the trestle (on which cars move from the dock to the ferry and vice versa) for at least another 12 years or so. The in basket: In July, there was a story in the Kitsap Sun that said Washington State Ferries had been granted $20.9 million to replace the Southworth ferry terminal. The work is scheduled to begin in 2015 and continue into 2018. The article didn’t say if ferries could still land there during the work, or if the run would be closed for all that time. I also wondered in the replanking of the vehicle holding area on the dock, done several years ago, would be preserved during the work. So I guess we’ll have a couple of years to get ready for whatever will happen when the work starts in 2015. The in basket: Poulsbo City Councilman Ed Stern said in an e-mail, “I notice on Highway 3, the signs for the Bremerton ferry in the vicinity of Bremerton all read ‘Seattle Ferry’ – very helpful and illustrative, especially for our out-of-town travelers, of which we have more than a few, especially in the summer. The out basket: I can’t say why, but Steve Bennett, traffic operations engineer for state highways here, says, “We can look at a sign redesign when the sign is up for replacement. We don’t want to spend the money now as the sign is relatively new and we have not had any other complaints. “Also, we do have ‘Seattle Ferry’ signs on the beginning of Highway 305,” he said. The in basket: A couple of city councilmen from Kitsap County’s north end recently asked the Road Warrior for help with problems they had spotted in the area, and I was happy to oblige. Bill Knobloch of Bainbridge Island was the first, appealing for help in February for a situation in which he’d found the state intransigent. Citizen Paul Sanders had brought it to his attention. “I am writing you as a result of a lost-in-translation communication with WSDOT concerning a continuing problem that directly affects the pocket book of many of my constituents,” Bill said. Right turns on red are prohibited from Highway 305 heading away from downtown onto Madison Avenue, but only by a small sign hanging from the wire that supports the traffic signal heads on 305, he said. Meanwhile, a more obvious sign on the roadside limits the right lane to right turns. “Considering the existing signs at the side of the highway just prior to the right hand turn, it appears to be a setup for the ordinary driver who will follow the ‘right turn only’ while not having the average scan to see the little white sign saying ‘no turn on red,’ Bill said. This summer Ed Stern of the Poulsbo council sent me the following: “I notice on Highway 3, the signs for the Bremerton Ferry in the vicinity of Bremerton, all read ‘Seattle Ferry’ — very helpful and illustrative, especially for our out-of-town travelers of which we have more than a few, especially in the summer. 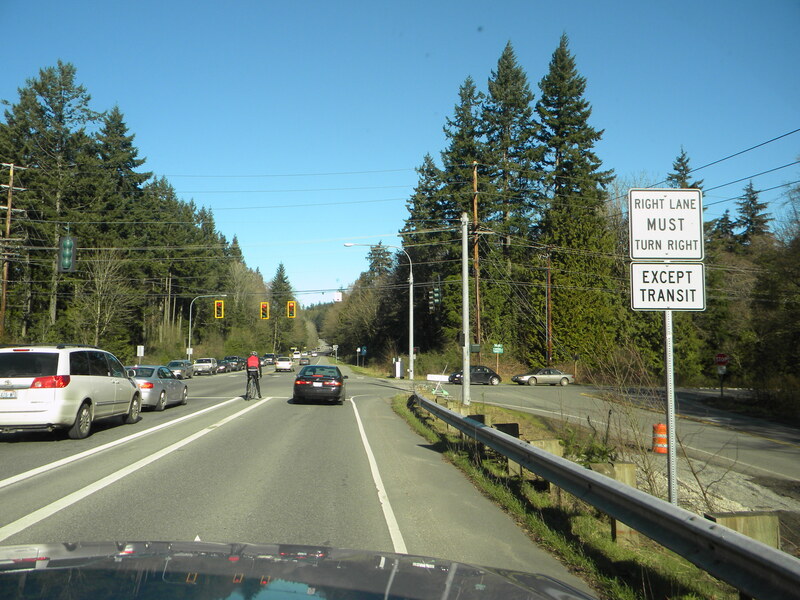 The out basket: Steve Bennett, traffic operations engineer for the Olympic Region of WSDOT, sent me an e-mail on Aug. 19 saying, “I wanted you to know that we will be ordering a second No Turn On Red sign to be placed on the side of the highway (305)…. I would expect that the sign will be installed next month.” Perhaps it already has been. Steve more or less concedes Ed’s point, but says it doesn’t rate high on the list of problems his department hopes to address quickly “We can look at a sign redesign when the sign is up for replacement,” he said. “We don’t want to spend the money now as the sign is relatively new and we have not had any other complaints. The in basket: On one of my rare trips aboard the Kingston-Edmonds ferry this spring, I was signaled by a deckhand to got forward to offload at Edmonds, only to be forced to stop before I got off the boat. It was clear to see why. A train was crossing from north to south on the tracks that cross in front of the terminal, interrupting the offload. I thought that with offloading so close to complete, it would make more sense to stop the train to prevent the ferry’s running late. It took me a beat to realize the whole on-loading process also would have to be finished before stopping the train would do any good. But I asked the ferry officials if that’s an option when a train shows up when loading the ferry is nearly complete.